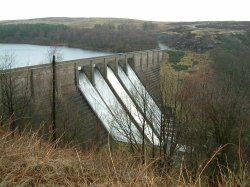 Thruscross Dam on Thruscross Reservoir. This reservoir, together with the Fewston and Swinsty reservoirs offers a number of waymarked walks. 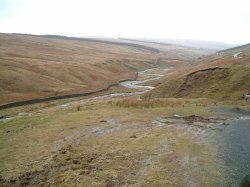 These reservoirs are 4-6 miles from Knabbs Ash. North-east of the quite Yorkshire village of Kettlewell, the rolling moorlands at Coverdale offer some outstanding views. 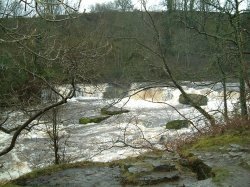 The river Ure flows over a number of rapids at Ayesgarth. A magnificent place to visit - especially after heavy rain in the area. Harrogate is famous for its Spa and Valley Gardens, and is also renowned for its shopping centre, and the Stray, all of which are well worth a visit! Knabbs Ash B&B is also ideal for visitors to Harrogate International Centre (HIC), the new exhibition and conference centre. Skipton 'The Gateway to the Dales'. At the southern base of the Yorkshire Dales, Skipton is a friendly town with a population of around 16,000. It has history, a castle, cobbled streets, ducks and canal boats. Knaresborough has much to offer visitors - a beautiful crag-top setting on a gorge of the River Nidd with the remains of an ancient castle; riverside walks and cafés; the curious Dropping Well; and the semi-legendary figure of Mother Shipton and her prophecies. Ripon offers so much antiquity to explore and so much to visit. There is the magnificent Cathedral, Thorpe Prebend House and the canal basin. From the vibrant Market Place, with its fine Georgian buildings and imposing 300 year-old obelisk, radiate quaint medieval streets filled with fascinating shops and tea rooms. Well known attractions include the Thackwray Medical Museum, the Armley Mills Industrial Museum, and the Royal Armouries National Museum of Arms & Armour. Why not enjoy a visit to York Minster, the National Railway Museum, the Yorvik Viking Centre, the York Castle Museum, and the Yorkshire Museum? If you've any time left, the shopping centres are worth a visit. If travelling to York using your own transport, we would thoroughly recommend making use of York's Park & Ride facilities. We can provide details if you require. Based in Harrogate, North Yorkshire. The local area around our Accommodation in Harrogate has lots of things to see and do.